Hubble’s latest image is another stunner — and just look at all the galaxies! Hubble has produced a new version of the Ultra Deep Field, this time in near-infrared light and taken with the newly installed Wide Field Camera 3. This is the deepest image yet of the Universe in near-infrared, and so the faintest and reddest objects in the image are likely the oldest galaxies ever identified, and they likely formed only 600–900 million years after the Big Bang. 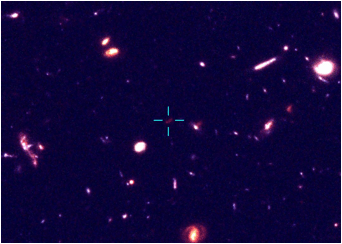 This image was taken in the same region as the visible Ultra Deep Field in 2004, but this new deep view at longer wavelengths provides insights into how galaxies grew in their formative years early in the Universe’s history. The image was taken during a total of four days in August 2009, with 173,000 seconds of total exposure time. Since infrared light is invisible to the human eye and therefore does not have colors that can be perceived, the image is a “natural” representation that in shorter infrared wavelengths are represented as blue and the longer wavelengths as red. The faintest objects are about one billion times fainter than the dimmest visible objects seen with the naked eye. Click here for a video zooming into the Ultra Deep Field. “The expansion of the Universe causes the light from very distant galaxies to appear more red, so having a new camera on Hubble which is very sensitive in the infrared means we can identify galaxies at much greater distances than previously possible,” said Stephen Wilkins, from Oxford University. The team that took this image in August of 2009 have made it available for research by astronomers worldwide, and a multitude of astronomers have been furiously searching through the data for the most distant galaxies yet discovered. In just three months, twelve scientific papers on these new data have been submitted. As well as identifying potentially the most distant objects yet, these new HST observations present an intriguing puzzle. “We know the gas between galaxies in the Universe was ionized (or fried) early in history, but the total light from these new galaxies may not be sufficient to achieve this,” said Andrew Bunker, from the University of Oxford. Installation of Wide Field Camera 3 by astronauts as part of servicing mission 4. Courtesy of NASA. “These new observations from HST are likely to be the most sensitive images Hubble will ever take, but the very distant galaxies we have now discovered will be studied in detail by Hubble’s successor, the James Webb Space Telescope, which will be launched in 2014,” said Professor Jim Dunlop at the University of Edinburgh. That’s a beaut; saucer of milk for table 4! @ LS, check out the first paper linked above, Fig 2, for orientation of the WFC3 field within the larger ACS field. Easy to get lost in all the galaxies. I’m blinking back and forth between the new NIR image and previous Hubble UDF releases. Sweet! These are high z images. I am struck by how well organized these galaxies appear at such an early time. The galaxies where you can see structure are closer and a bit older. Within a few hundred million years after the end of radiation dominate period or the last ionization scatterin sphere (the CMB) large scale structures emerged Inflationary cosmology removed most inhomogeneous distributions of matter, and flattened out perturbations on homomgeneity grew into large structures such as these galaxies. Red distant galaxies appear well structured. The red color is due to the light being absorbed and re-emitted by dust. More distance = more dust = absorbed and re-emitted more often = more red. Why should these the oldest if our Milky way is some 13,2 billion years old thus being around same age or older? Standard cosmology is non-steady state, and most parameters tested beyond 3 sigma. AFAIU inflation is the one piece holding out on lower sigmas, say 2.6 s or so. And famously 3 sigma is “tested beyond reasonable doubt” as regards theory predictions physics. RUF, wrong! If the redening were due to such scattering there would be lots os spectral broadening and lost of spectral information. That does not happen! I have been following UT for some time, but looking at this, I suddenly realized how little I know. Is every point of light in the photo a galaxy? I assume so since it is so far away that we wouldn’t detect a single star. So I’ll back up. When I look at the night sky, is every point I see a galaxy or else a star in the milky way? Are there any lone stars between galaxies or are all stars associated with a galaxy? If my questions are too basic, I apologize and will go off to look up the answers. Thanks. The points of light which are distinct are galaxies. The background has a lot of random speckled dots on it, where many of these could be noise in the instrumentation or the CCD. Yet any clearly visible dot, or one which has some extent or shape to it is a galaxy. Cleary the larger galaxies are not as far out, where there are a few there which appear as one might see Andromeda in a 6-8 inch scope, and these are clearly not as far back in space and time. LBC already answered your first question, so I’ll answer the other ones. When I look at the night sky, is every point I see a galaxy or else a star in the milky way? Most points you see with the unaided eye in the night sky are, indeed, stars of the Milky Way. With some exceptions: In the northern hemisphere the Andromeda galaxy is visible (assuming it is dark enough) and in the southern hemisphere the Magellanic clouds are famous objects beyond the Milky Way. So not every point in the sky is bound to the MW, but most of them. Are there any lone stars between galaxies or are all stars associated with a galaxy? Leaving Lone Starr and the mog Barf aside (haha! ), the answer is “most likely”. We see some stars in the MW rushing so fast that they are able to leave the MW in a few million years (say). Especially when it comes to galactic mergers it is likely that some stars are ejected out of the system. So, yes, it is likely that there are lone stars between the galaxies. We haven’t seen none, as far as I know, but this doesn’t rule them out, of course. If my questions are too basic, I apologize and will go off to look up the answers. Thanks. There are no “too basic questions”. Every question can be answered (assuming that an answer is possible, at all 😉 ), and most of them will be answered. Don’t hesitate to ask! I was having a similar problem. What I do to log out is click on my screen name which will take you to your profile. You can then log out there. Hope this helps. Thank-you for your replies. I can’t believe these questions didn’t occur to me sooner. You have just given me an order of magnitude increase my appreciation of these photos. Next PostNext What Would NASA Do with an Added Shuttle Flight?